We at Lochmann Transport put great value on the quality of our services. 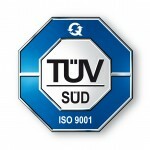 After obtaining the internationally acknowledged ISO-Certificate in 2001, we have been constantly engaged in screening and improving all processes within the company. When it comes to the modernisation of our fleet, software and providing the necessary expertise to our employees, we do not spare any expense. Efficiency and professionalism in the job, maintaining a healthy company climate and customer satisfaction are our main concerns. This, only this way we manage to always grant you constantly high quality standards.